2.2 mm. / 1.5 mm. What a great value! Sharpens easily to a near-razor edge. Edge retention has been good. I use it to clear an overgrown area with a large downed tree so I can work safely with my chainsaw. It breezes through the softer stuff like it isn’t there. I have also used it to cut smaller (1/2-3/4″ diameter) hickory branches from the tree. No edge rolling, chipping or deformation. Have used it frequently and not needed to resharpen. I did go over it with a file to clean up the factory edge and get the tip sharpened. Then a couple of passes with a diamond hone. I have cut piles of stuff with it and it has not needed to be resharpened yet. Great tool at a great price. Very satisfied with this purchase! Does the job, easy to sharpen because it is not made of hardened steel. It has a long blade so it has weight behind every swing. It’s only draw back is it’s soft metal, which requires constant sharpening. A bench grinder or a file is a necessity and I wish it had a saw blade on the back side. I purchased several of these on multiple trips to Brasil. Only paid about $3 a dozen years ago. This is a serious work tool. Saw them to work in the sugar cane fields. They are often reshaped so mane times that the steel is half of the original width. I highly recommend this as a working or even a self defense tool. You wl not be disappointed at the current prices. This appears to be the heaviest of your ordinary 18 inch machetes by a couple ounces if the listed weights are accurate, and it really delivers a chop. It’s comfortable to work with, but you know you’re holding it. Best quality for this price range. I have 3 of these 22, 18 and 12″, I use them on a wide variety of tasks and I’m extremely pleased with their performance and endurance. The 18″ is the most versatile, but if you need to cut larger saplings or thick branches the 22″ will serve you better, while the smaller ones (12 or 14″) are more comfortable to carry (when hiking for example). For safety reasons the tip of the blade isn’t sharpened at the factory. The tip is the most likely part of the blade to get injured on during use, so they leave it dull. That is not a problem, and can be sharpened with a steel file in just minutes. The factory cutting edge is for utility, and all cutting tools eventually need to be resharpened; there are no exceptions. 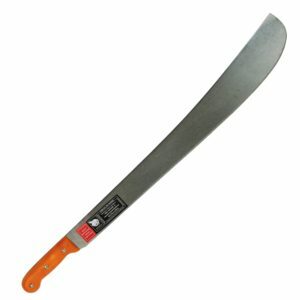 This is a good machete, simplistic, and very tough. Also, there’s plenty of material on the blade and handle to work with if you want to modify it. I purchased mine at Lowe’s for $15 and it came with a pretty nice black nylon sheath. Tramontina makes machetes in a country that knows the tool intimately, and that fact is very clear. The 1070 carbon steel blade is tempered just right, the hardwood handle is very nice, and its performance is excellent. Don’t hesitate because of a low selling price, Tramontina doesn’t need to rob your wallet to provide you with a great cutting tool. The blade resharpens about the same as any other long carbon steel blade, it will take a few minutes and shouldn’t be rushed. I am very happy with mine, and would recommend it to anyone needing to clear some brush, make a trail, or prune some overgrowth. But it’s also excellent for camping, hiking, and hunting. I won’t go into details, but it can field-dress a deer (the quartering) with ease. 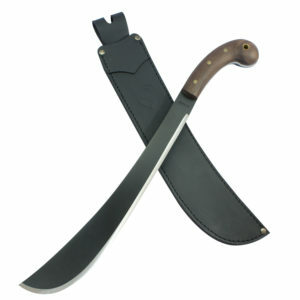 The overall machete has a rigid flexibility that won’t bend out of shape, it doesn’t tend to bounce if you make a bad swing, and stays sharp longer than other 1055 carbon steel machetes. The 1070 carbon steel used by Tramontina is done right, and it will prove itself over and over again. Perhaps this might help, and as always, be safe out there. A basic, nicely priced machete that works well and sharpens easily to a nice edge. I wish I had bought one years ago for all the trimming, clearing and pruning I do here. Adds a bit of fun to the work.